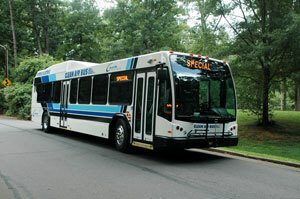 (June 20, 2014) The Charlotte Area Transit System (CATS) is expanding Route 55 to serve the new Charlotte Premium Outlets beginning June 30. The outlet mall plans to have its Grand Opening on July 31. Route 55 currently travels from the Sharon Road West LYNX station along Westinghouse Blvd to Westlake Business Park. From Westlake Business Park, it travels north on Steele Creek Rd, turns right on Brown-Grier Rd, turns right on Whitehall Park Dr, and turns right on S Tryon St, returning to Westinghouse Blvd. The loop on Brown-Grier Rd, Whitehall Park Dr, and S Tryon St is being discontinued. Dixie River Rd currently is being widened and is closed for construction. Until it is open, the bus route will continue north on Steele Creek Rd, turn left onto Shopton Rd, turn around at the traffic circle at Robbie Cir, and return along the outbound route. Dixie River Rd should be open by the time of the July 31 mall Grand Opening. Once the streets through the mall parking area are opened and a bus stop is established adjacent to the mall, the route will be adjusted to use a street (likely New Fashion Way) closer to the mall. New weekend service will also be added on both Saturday and Sunday. Direct trips between the Sharon Road West LYNX Station and Westlake Dr will continue to operate weekdays. Customers previously boarding the Route 55 inbound along Westinghouse Blvd or Steele Creek Rd will need to cross the street for trips back to the LYNX station. Existing stops along Westinghouse Blvd and Steele Creek Rd may be used to travel outbound to the new outlet mall. The current route has a large number of riders going to or from Westlake Business Park and the apartments on Steele Creek Rd but has few riders on Brown-Grier Rd and Westlake Park Dr. Customers along Brown-Grier Rd and Westlake Park Dr may walk to Steele Creek Road for the 55 – Westinghouse route or to South Tryon Street for the 56 – Arrowood route. The new schedule is available here: Route 55 - Westinghouse. For information about the route change or other CATS service, contact Brian Horton of CATS at bhorton@charlottenc.gov or 704-353-0018, or visit the CATS Web Site.